Vinyl windows with frames made of uPVC (unplasticized polyvinyl chloride) extrusions insulated with a polyurethane core are much more energy efficient than wood, multi-chambered hollow vinyl, aluminum, and composite windows. Also make sure you look at the R-Factor of both glass AND frames. 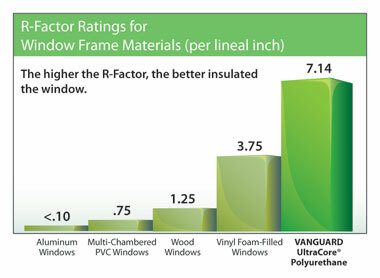 Remember, the greater the R-Factor the better the insulating value. All Vanguard Windows are constructed with a polyurethane core. If the corners are fusion welded together the corners will never leak, which means neither water nor air will penetrate through the frames of the windows. However, if the corners are either screwed together, mechanically fastened or chemically welded, then they can start to leak over time. All Vanguard Windows are completely fusion welded. Energy efficient glass graphicMost windows are available with Low-E Glass, some Low-E coatings are pyrolitic (hard coat), some are sputter coated soft coats, and some even contain 2 layers of Low-E coating. No matter where you live, Vanguard Window Systems can provide a high performing Insulated Glass System that will save you money heating and cooling your home. How have we done it? 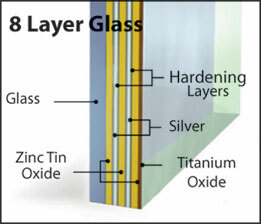 By incorporating multiple layers of reflective metallic coatings into our panes of glass. It’s one more advantage that Vanguard Window Systems has over all our competitors. Products are tested and rated by the NFRC (National Fenestration Rating Council), which have certain guidelines windows must pass to be considered energy efficient. Only the best performing windows will have the ENERGY STAR® approval by the U.S. Department of Energy for outstanding energy efficiency (utility cost savings). The department rates products for three different geographical regions in the United States, so many windows may not be ENERGY STAR® approved in all regions of the country. Vanguard Windows are ENERGY STAR® approved in all regions of the country. Windows offer a wide range of warranties. Some offer the warranty for 5 years, many windows are warranted for 10 years, and others offer a lifetime warranty, maybe pro-rated after a few years. Vanguard Windows’ warranty is a lifetime, non-prorated, transferable warranty. If any part of your window ever breaks or fails, it’s covered!